Nothing can quite compare to the classic beauty of the steel spiral staircase. Whether its application is a trendy loft style apartment or a luxury home, there is something appealing about its graceful winding shape that makes it a popular choice with homeowners both for indoor and outdoor use. And there is good reason, why steel spiral staircases from Spiral Stair People as so popular across North America. Unless you plan on opting for something like a ladder (which is hardly practical for most families), a spiral staircase will likely be your most efficient option. This will leave your home with more usable space for living. Another advantage that steel spirals have over traditional straight stairs is the ease with which they can be constructed and installed. Conventional staircases require the expertise of a carpenter and pieces must often be measured and cut onsite. Not only can this become quite costly and time-consuming, but homeowners must endure several days – if not weeks – of inconvenience, while there home becomes a construction site. 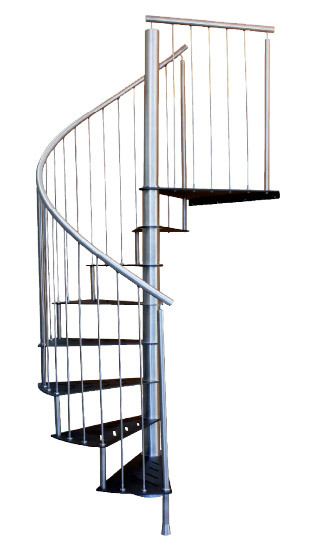 A steel spiral staircase by comparison is much easier to assemble and install within a matter of hours for both the professional and the DIY homeowner. It is no secret that steel is a very strong and durable material. When it comes to a feature like such as stairs which are meant to take people’s weight every day – this is all the more important. Most traditional stairs are made out of wood – which over time wears down under constant strain. Wooden stairs can become saggy and creaky and soon require repair work. Steel on the other hand can last many more years. Unlike traditional staircases, steel spiral staircases are not weight bearing. This means that they can be placed just about anywhere in your home that you’d like to have them. They are a great option for homeowners who would like to have a second staircase on the other side of their home or perhaps those who would like to have stairs leading down to a deck from an upstairs balcony. Some homeowners even have them installed, not as a means to get from one floor to the next – but for other purposes such as unique shelving and bookcases. Finally, you simply can’t ignore the fact that steel spiral stairs are beautiful. So beautiful, in fact that they are popular design choices both for apartments as well as for high end homes. Multi-level homes need stairs – that is just a practicality – but why not have both the beauty and practicality that is found in spiral stairs? Options for customization – from colour coating, to spindle and railing choices – can you to make your staircase your own. The spiral steel staircase kits that we carry are available in a variety of different sizes and options for customization. If you’ve decided to add a graceful spiral staircase to your home, call us today to find out how we can meet your needs and help you create your vision.